Avner Bar Hen, Professor of Statistics at the University of Paris Descartes. His primary research interests are in multivariate analysis, forest dynamics modeling, phylogenetics, and the generalized linear model. From 2008 to 2011, he served as president of the SFdS (French Society of Statistics). 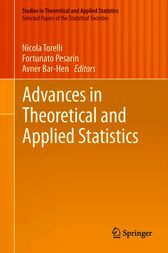 Fortunato Pesarin is an emeritus professor of Statistics at the University of Padua’s Department of Statistics. His main research interests included nonparametric methods, bootstrap and permutation tests. He is co-author of three leading books on multivariate permutation tests based on the nonparametric combination methodology of dependent permutation partial tests. Nicola Torelli, Professor of Statistics at the University of Trieste. His interests focus on the analysis of data from complex surveys and classification and clustering techniques. He is currently president of the SIS (Italian Statistical Society).